Once when a King called Ubharisaravasu was in penance on Lord Vishnu in a Purasai Forest, Saint Dhurvaasar came by that side. Since Ubharisaravasu was in penance he had not noticed the coming of Saint. Dhurvaasar got angry and cursed his to loose all his strength and power. 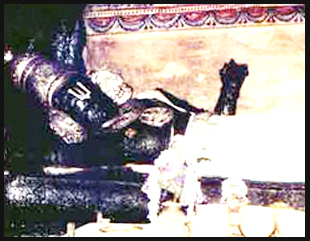 Ubharisaravasu immediately came to know about it and begged Dhurvaasar to pardon him. Saint Dhurvaasar asked King Ubharisaravasu to go Palasavana Kshethram near Cauvery River and perform Annadhaanam to 1 Lakh peoples. King immediately left to that place with a battalion of Cook. The population of that place was only few hundreds, so he thought of distributing food to who ever comes to that village. Every Day he was able provide food for people in thousands. The king was also happy. One Day early morning an old man came to king and told him that he is very hungry. The king performed his poojas very fast and served food to the old man. The old man ate the complete food prepared for thousands of people and still felt hungry. The king requested the old man to wait for some time to cook again and asked the old man whether he require any snacks in the mean time. The old man asked king to get him "Appam" in a pot. The "Appam" was made very fast and king brought it a pot full and gave it to the old man. While eating the "Appam" old man became Lord Vishnu and removed the curse of king given by Saint Dhurvaasar and laid down there with the pot full of "Appam". So the Lord here was called as "Appakkudathaan". The diety has a pot in His right hand. Direction and Posture Bhujanga Shyanam and West-faced. Access to the temple The sanctum sanctorum is about 30 ft high. Reach Thiruper Nagar from Anbil by crossing the Cauvery river. Or reach from Trichy Junction via Kallanai(About 15 miles). Bus facility is available in plenty. The Moolavar of this Sthalam is Appakkudathaan. He is also called as "Appalaa Ranganathan". Prathyaksham for Ubamannyu and Parasarar(Bhattar). Moolavar in Kidantha Kolam and in bhujanga sayanam facing west direction. This temple is located between River Cauvery and River Kollidam. This temple is approachable from Kumbakonnam, Trichy and Thanjavur via Thiruvaiyaaru, Boodhalur, Thirukaatuppalli and Kallanai. It is around 7 kms from Boodhalur Railway Station. While coming from Trichy we can come to Kallanai and then reach this temple. We have all facilities here. We can either stay at Koviladi or at Thirukaatuppalli and visit this temple.